There are any number of ways to go about priming your models. I'd venture to say that the majority of us use spray paint to get this part of the process done. That being said, there are still some decisions you have to make when it comes to picking a color and brand of paint. What color should I use to prime? In all the work that I've done, I've found it best to try and match my primer value (lightness or darkness) up with the majority of the color on the model I'm painting. By that, I mean if it's a light colored model, I go with a light colored primer... if it's a dark model overall, I'll go with a dark colored primer. Beyond that, I've narrowed my selection down to two colors. Light Grey and Flat Black. Of the two, the light grey is actually a "primer" and the black is just regular spray paint. As far as primer goes, if you had to get only one color to do all your work with, you can't go wrong with black. GW's Foundation Paints have gone a long way towards helping us get good coverage over certain colors and reducing the amount of layers we have to do sometimes to get a nice, consistent coat of paint. Still... if you can reduce the number of layers (and the amount of work) by using an appropriate color primer, you'll do better in the end. I don't use white as it makes it hard for me to see the details on the model when I'm working. I have fairly bright lights over my desk and all the details tend to wash out. Now I could use white and then give it a wash of some sort to pull out the details, but I can do both by moving over to a light grey color and save myself the extra step. I do enough painting these days that I try and keep it easy on my eyes since I'm not getting any younger. There will always be exceptions to the rule. In the case of my Lustwing army, I could have used black or even the light grey, but by using a primer that was actually colored (reddish brown), I created a very unique look for my army. 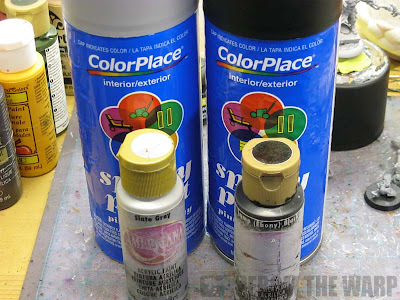 By going with the reddish brown here and leaving it showing in the recessed areas like I would do if I'd primed with black to create instant shadows, I basically created a "rusted" model without having to do much work. There are other aspects I used with this force like a limited palette, but by using the brown colored primer, it gave the whole army a completely different feel than if I'd used any other color. I did something similar when I painted up a squad of Adeptus Custodes as well. Instead of priming with black, I opted to use a brown color. That way, when I went over it with the gold, it kept the warm feeling to the gold. That was a case of the armour being mostly gold and the primer helping me get there instead of working against me. I tend to do that for metallics (gold and silver) only. In the case of any other model like say Ultramarines, I start with the light grey or black and do not prime the whole thing blue. What brand of paint do you prime with? Now here's a good question. Some people will swear by certain paints and others won't go near those very ones at all. I'd say the decision comes down to two things. Some paints can get real expensive and with a larger army, the cost can potentially add up as time goes on. Especially if you're looking to do a number of vehicles. not all expensive paints are good and not all cheap paints are bad. The ones I use can be picked up in the States at Walmart for about a dollar a piece. Not anywhere near as expensive as some other brands out there today. If you like the results you get by using a certain brand, then run with it. There's nothing to say you have to use a certain brand over another to get good results. If you're comfortable using Brand "X" over Brand "Y" and you know you can get the results you want, then it doesn't matter what the name on the side of the can says. Now there are other factors like accessability that might impact what kind of paint you use. 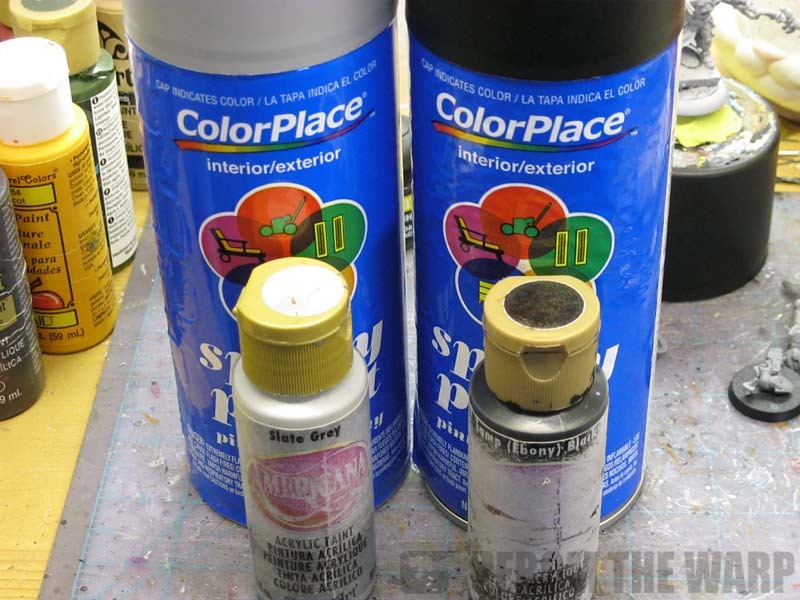 If you can't get a hold of a certain kind of paint without jumping through a hundred hoops and waiting six months for it to arrive, it might be time to look for something new. If you notice in the picture at the top, I have two small bottles of paint next to the spray cans. They are for touch ups. they are both from Americana and they are Slate Grey and Lamp (Ebony) Black. I use these to touch up any areas I may have missed when I was spraying my models. It took a bit of trial and error, but I've found these two colors match these two colors/brand of spray paint exactly. And you don't have to have an exact match to do the same thing either. I tend to go light on my spraying so that I don't run the risk of obscuring any surface detail with a heavy coat of spray paint. The brush on paint helps me get complete coverage before I start putting down the basecoats. 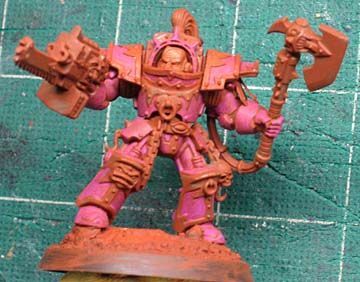 In the end, priming should be an easy beginning step that helps with the overall look of your model. It should give you a nice, clean surface to start working on, show you the detail you need to see and not create any unwanted side effects like additional surface texture. If you can get that from your spray primer, you're doing pretty good. Perhaps Oddly enough I tend to be able to spray the models without requireing any further touch up! I say oddly, because everyone else I know has real trouble with this, to the point where people often ask ME to prime their models!? I'm not sure what I'm doing differently to them, but perhaps that is the next step for you to write about. 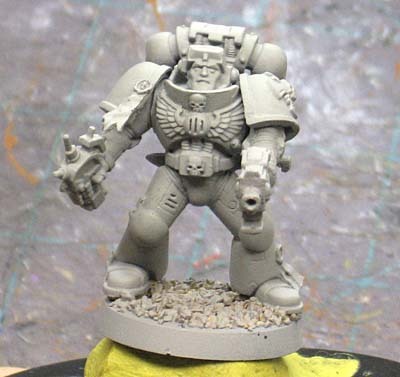 I know it sounds stupid "how to prime your model" but it is certainly a very important piece of information! I am one of those people, for what ever reason priming is the part that I have the most troubles with. Either I miss a lot of area or I get patches of fuzz so that I have to clean the model and start over. A very simple step by step guide on priming would be appreciated. It's done then, I'll grab a model this afternoon and document the process I use to physically prime a model. I use a krylon spray primer, it has a fan-shaped discharge that keeps the flow very smooth and even. I've never had an issue with grain or with wads of paint obscuring details with this primer. And I live in phoenix, and do my priming outside. most primers start drying before they even hit the model out here, it's that hot. Nagi21: You buy the good stuff! I buy the cheaper stuff than that. But... I'm sure there can be something said for good primers though. Like paintbrushes I suspect. I already learned my lesson on those. Longscope: You know what, I don't like those kinds of tips. I'd rather have the regular cone shaped nozzle on the cans I use. SIDE NOTE: I'll be posting my actual priming process tomorrow too. There is one thing that helped me prime my models better. Preheating of the spray bottle. I simply pour half a bucket of hot water from the tap and insert bottle there for a few minutes (I usually position my models in this time). Then take it out of the bucket, dry it with towel and go spraying. Warm paint gives better coverage (finer mist) - much better results from this simple step. lehcyfer: You know, I've done this very thing and haven't found it to help much at all. In fact I don't remember there being any difference in the results.